Lean standardized work is a comprehensive tool enabling safe and efficient production of high-quality products. As such, it is at the foundation of 21st-century operational problem solving and technology advancement. Most companies have implemented standardized work as part of a transformational strategy but, more often than not, such efforts have fallen far short of expectations. This book helps to explain why. More importantly, it provides practical, easy-to-follow guidance on how to develop and sustain a highly effective system of standardized work, a system companies need more each year to remain competitive in todayâs global market. 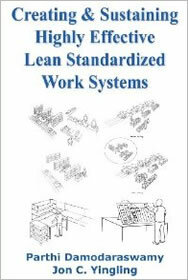 The book begins by outlining the nature, structure and goals of lean standardized work. It then goes on to explain a simple methodology implemented by the authors with great success at numerous manufacturing facilities. Real-life examples taken from standardized work development efforts at these firms help to illustrate the strengths of this methodology as well as the pitfalls that can occur when companies fail to address the components needed to implement an effective, sustainable system. Companies exploring lean systems and standardized work for the first time, as well as those looking for hands-on guidance to improve systems already in place, will find this book invaluable. People and companies struggle with problems every day. The C4 process can ease these struggles. Modeled on well-established problem-solving and continuous-improvement strategies such as PDCA (plan, do, check, act), C4 offers straightforward, easy-to-remember techniques for identifying and solving workplace problems. 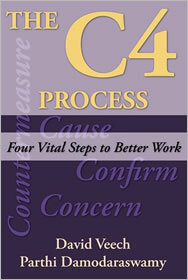 C4 is short for Concern, Cause, Countermeasure, and Confirm. These four steps-clearly identify the concern, find the true root cause, correct the cause with an effective countermeasure, and confirm that the solution worked-are vital tools for substantially improving both the work and the workplace. C4 does much more than solve problems, however. When deployed as recommended it results in a steady improvement in brainpower within the workforce. Organizations that focus on developing people rather than simply solving problems open the door to higher levels of employee engagement, satisfaction and confidence.